Whether you’re constructing roads, building pathways, laying a parking lot or completing a bridge, the paving process involves multiple machines to help you get the job done on time. From compactors to asphalt pavers, Gregory Poole has the equipment you need for each step. Gregory Poole is your one-stop source for all of your paving needs. A very competitive business with strict safety and regulatory concerns, paving and roadwork requires a top-notch level of equipment, support and service. Gregory Poole understands the paving industry and will guide you in selecting the best equipment and will offer full service and support that you can depend on. We’re experienced, dedicated and committed. You can count on us for the machinery, the people and the service. Within our fleet of available asphalt pavers, we offer machines like the AP1055F Mobil-Trac Paver and the LeeBoy 1000G Track Paver. We even have the BA7000 Asphalt Recycler and SE50 VT Tamper Bar Screed as well as many other asphalt construction equipment options. Our stock of paving equipment includes every machine from the Commander III Concrete Paver and LeeBoy 150 Asphalt Distributor to the Rosco Challenger6 Broom and Weiler W330 Road Widener. Check out what machines we offer by clicking on the specific links below. When it comes to our asphalt paving equipment, we provide several manufacturers to help you match specific machines to your projects. 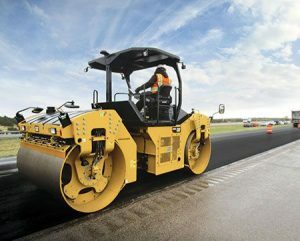 Working with a highway, governmental or interstate job, you can rely on Caterpillar® for top-quality and dependable equipment ranging from pavers and rollers to compactors. Cat engineers know each day can bring new challenges, which is why they build innovative construction and paving equipment. For example, Cat cold planers have refined systems based on input and are also equipped to your needs. They require simple maintenance and are fuel-efficient and easy to operate. All Cat machines support you from the base up. LeeBoy Asphalt Pavers provide the power and precision ideal for work on country roads and parking lots. LeeBoy’s Rosco Asphalt Distributor Trucks are ideal for larger projects. The brand constructs reliable and productive equipment that generates higher revenue and profitability for your business. You’ll work with easy-to-maintain machines and receive global support no matter your location. Versatile and reliable, Gomaco Concrete Pavers and Curb and Gutter Machines are versatile and reliable. Their curb and gutter machines can trim and slipform at the same time and tackle more projects such as bridge parapets, barrier walls, recreational paths and more. Gomaco pavers are a type of slipform paving equipment that can pave widths reaching up to 50 feet and depths up to 19 inches to meet your strict specs. Weiler remixing transfer vehicles make non-contact, non-stop asphalt paving easier.They have high torque, direct-drive motors and a loop flush cooling system for long-term operation. Weiler road wideners are available in four sizes to assist in placing the right amount of material at the correct grade and slope in one pass. Their machines can widen up to 14 feet, and they offer variable-speed with a dual-end drive system. The wideners minimize buildup with a self-cleaning head, return pulleys and a tail. Browse our paving and compaction equipment, contact us online or call (800) 451-7278 to speak with a Gregory Poole representative for more information. With over 65 years in business, we know what you need and are here for Product Support to keep you productive.